Virgil Abloh’s creation at Off-White is no short of sporty edge. Last collection’s show which featured Track and Field Theme collection for Spring 19 was obviously a hit. Collaboration between Off-White and Nike is also a hype no one can miss. This Fall 2019, Abloh is giving us a street-smart sportwear with a ladylike edge. All the hype about street fashion is on display, such as: Turtlenecks, tie-dyed sweatshirts and sweatpants with a more polished touch. This is also not the first time they played with super-feminine elements – Spring 2018, they had done one collection inspired by the one and only, Lady Diana. 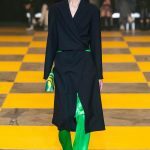 In this collection, you will find long trench coat with a neoprene but silky fabric, leather look, also unique dress with one cut-out long sleeve and one ruffled cap sleeve. 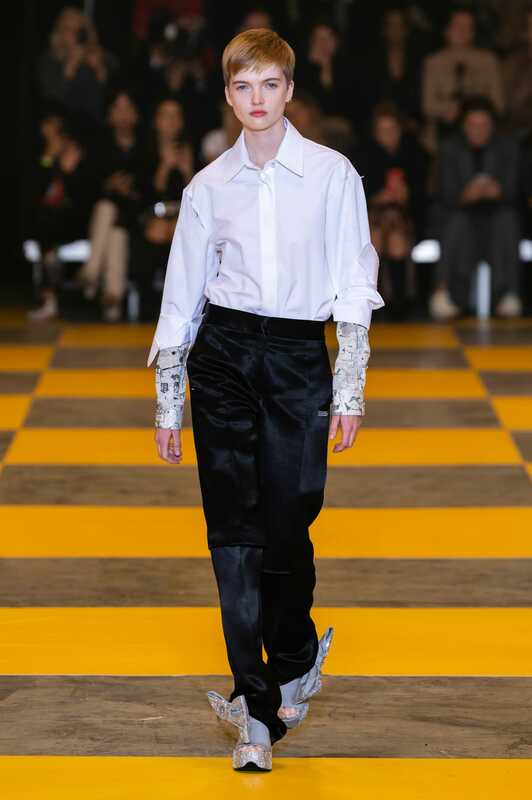 Some looks are still androgynous enough, such as the white shirt with double long sleeves and a silk black pants. 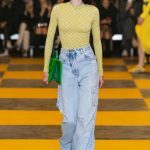 A streetwear collection wouldn’t be complete with some unique jeans number; and this time, they have checkered prints presented in light grey and yellow, made into a long train dress. From this show too, you can see the rise of neon green color that has made headlines in numerous fashion shows.